After a very unsatisfying Thai curry, served by real little Thai people yesterday lunchtime at a food court that should’ve know better, I concluded that they had cheated and used a dodgy packet mix. This left a nasty taste in my mouth in many ways, so I had to rectify the situation by cooking my own Thai curry tonight. 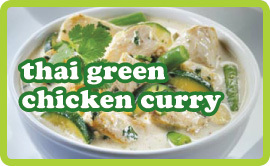 This green curry was delicious, and if I wasn’t 6ft 3″ and pinker in complexion than George from “Rainbow”, you would surely mistake me for a Thai housewife. To make the paste: Blend all the paste ingredients in a food processor or with a hand blender into a very fine paste. To make the curry: Heat the oil in a wok over a moderate temperature. Add the paste to the pan and stir for 3-4 minutes until fragrant. Add about 1/4 cup of the coconut milk and stir in for another 2 minutes until a little oil separates. Add the chicken and stir for 2-3 minutes. Turn up the heat, then add the coconut milk, lime leaves, fish sauce, the rest of the lemon grass stalk and the sugar. Stir well. Sprinkle over the reserved coriander leaves and bring to the boil. Reduce the heat and simmer partially covered for 30-40 minutes. Add the beans and simmer for a further 5 tinutes until just tender before serving. Sprinkle over more coriander or fresh Thai basil and fresh chopped tomatoes.